My name is Harikleia Sirmans. I created this website out of love for fabrics and sewing. I take a piece of plain fabric and I create something out of nothing. My passion for sewing began at a young age in Greece. I learned how to embroider, crochet and knit. I loved to play with my dolls and use fabric scraps to make them clothes. My parents recognized my talent and they asked Mrs. Zaharou, a local seamstress, to teach me how to sew. I spent three whole summers with her and she told me that I was the best student she ever had. She taught me how to cut straight on the fabric by measuring the client’s body and transferring those measurements on the fabric. We had no knowledge of sewing patterns back then. She taught me how to fit the garment on the body and make adjustments until it was just right. Her sewing machine did only straight stitches which meant that I had to learn how everything by hand: hemming, zig zag to prevent seams from fraying, buttonholes, and other hand stitches. At 17 years of age, when I felt that I had mastered the craft, I opened my own atelier and I started sewing like a maniac! I started with my grandmother’s Singer sewing machine which I had to turn the wheel with my right hand and hold the fabric to stitch it with my left. It was very difficult to maneuver the fabric while turning the wheel. Later I bought a Singer sewing machine that was powered by a foot pedal. Now I had both hands free to maneuver the fabric. My sewing machine would do only straight stitches and zig zags. After a few years, I finally bought an electric Singer sewing machine with more features and stitches. When I started sewing on my own, I would buy the Burda magazines which had fashions with patterns inside and I would teach myself how to read, cut, and alter those patterns. When I lived in London, I took two pattern cutting courses from the London Centre for Fashion Studies. I really enjoyed that and my professor complimented me on my pining method: “You put the pins like the Chinese. All in order facing one direction.” My dream was to attend a fashion school, but my life took a different turn, and so I satisfied my self with books on fashion design, pattern cutting, quilting, sewing and anything else I could find and learn from on the trade. I have sewn from scratch custom garments for women, men, and children (skirts, dresses, blouses, shirts, pants, suits, jackets, evening wear, costumes, uniforms, cloth diapers); home accessories (curtains, drapes, valances, pillowcases, pillows, linens, embroidered tablecloths and doilies, duvet covers); accessories (handbags, men’s ties, scarves); pet accessories; alterations–you name it–even covers for my car seats! I am very picky when I shop for ready-to-wear clothes because I cannot find the styles and fabrics I like. Or the clothes may be too expensive to buy. Ready-to-wear clothes are ill-fitted and poorly constructed. For me, sewing is frugal, relaxing, satisfying, and creative. It saves me money and my wardrobe is unique. I sew constantly for stress relief. I sew like a maniac! 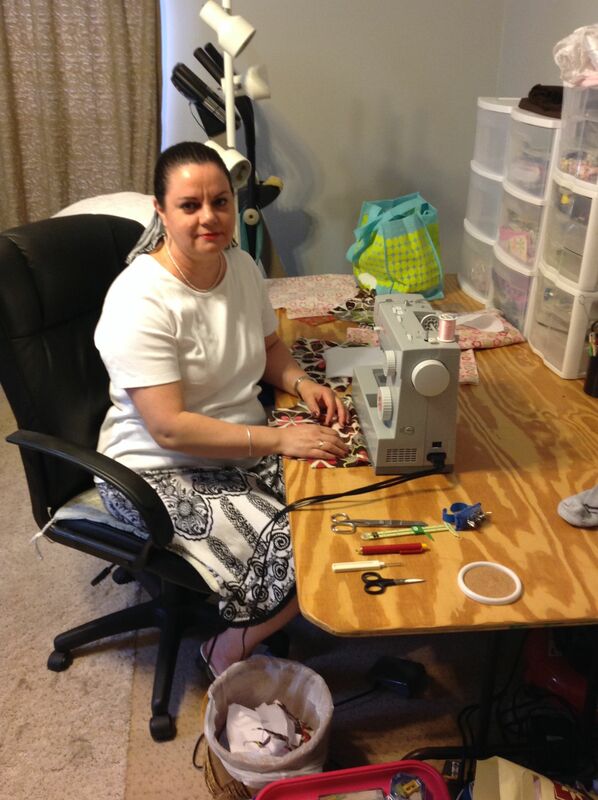 In this website, you can see photos of my sewing creations, get inspiration for your own projects, place customs orders with me, contact me for clothes alterations and sewing projects, and purchase items from my Square store.